Party Food gives you more than four hundred recipes for finger foods, ranging from the quick and the easy to those that are more lavish and intricate, for party givers who enjoy spending more time in the kitchen. Party Food is as simple as focaccia and as unusual as Mini-Moussaka Rolls; as elegant as classic French PCté en Croûte and as basic as the perfect Papaya Salsa to serve with chips.Party Food is beautifully illustrated, brimming with 150 color photographs that show you not only individual dishes, but magnificent spreads and buffets. 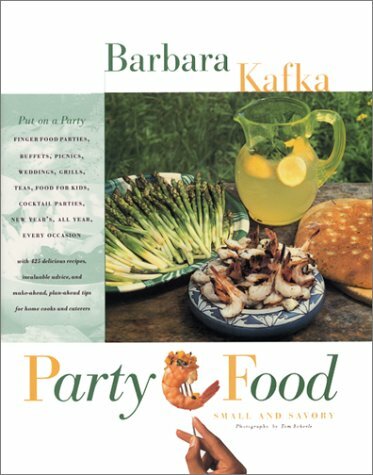 Barbara Kafka has created exciting foods that will tantalize everyone's taste buds: Fresh Tomatillo Salsa, Roasted Red Pepper and Mushroom Salad, Vegetable Skewers, and Grilled Marinated Shrimp, which let your guests enjoy sensuous flavors while they mingle and help themselves from bowls and platters. The variety of recipes is astounding -- take your pick from fifty different dips and let your planning evolve from there. In addition, Party Food is chock-full of vegetarian recipes, which are highlighted in green.One of the most important goals of party planning is making sure that throwing a party doesn't interfere with enjoying it. Barbara Kafka offers explanations of how far ahead a recipe can be made, how dishes can be frozen and/or reheated, and how much of a given item you will need per person. She shares secrets such as freezing chicken to make it easier to cut into strips for kabobs, and using your microwave to reduce preparation time. She also offers a host of flexible recipes such as Sun-Dried Tomato Dip, which can be served by itself, used as a pasta sauce, or enlisted as a base for dozens of other dishes. Party Food is simply the single, perfect party reference for any occasion.